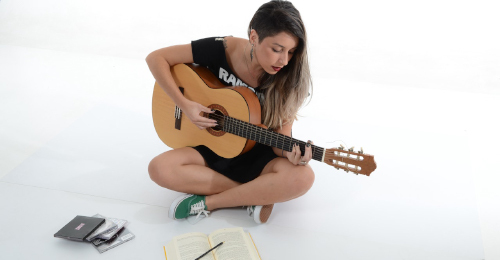 If you are the type of person who is able to be organized about the things you really care about, then you posses an ability just as powerful as "natural talent", when it comes to being successful with learning, and continually growing as a guitarist and musician. Organization is Power. I realized this clearly one time while cleaning out a kitchen drawer, the kind that becomes a catch-all for all kinds of stuff. I found so many things in there that were very useful, or could be, if I knew they were there. But because of lack of organization, I didn’t even know I had them, so they were useless to me. In other words, my lack of organization had decreased my power. ​Ergo, ​organization Is power. The most fundamental Principle of Correct Practice On Guitar is: "Your aware, thinking mind is your primary practice tool." Awareness is developed by the use of Attention. Lack of awareness is caused by lack of attention. Dis-organization is caused by a lack of Attention to the "over-allness" of a situation, for us, to our playing and practicing. I am going through all of this, because if you do not clearly see the necessity of expending the energy to be organized, you won’t make the effort. And it is an effort. It is so much easier to just rush headlong in to whatever we feel like doing at the moment in our practicing, and not stop and think and analyze. 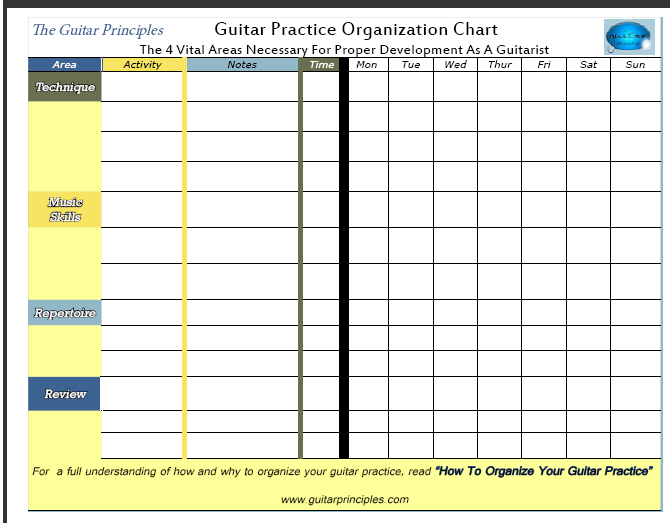 And of course there is a time and place for "un-organized" practicing and playing, but there is certainly a vital need for an overall awareness, and direction to our efforts to develop and grow as guitarists and musicians. A good analogy is that of a bodybuilder in a gym. Anyone who just goes in to the weight room, picks up a few weights here and there as the spirit moves them, doesn’t really keep track of what they are doing day to day, and what results they would like to achieve, simply is not going to get any results. Like the bodybuilder in a gym, if we want to see the best results from our practice, we need an intelligent approach, consistently applied, and based on an understanding of the mechanics of playing the guitar, and the musical skills and knowledge we must acquire to function as guitarists and musicians. ​ So I am going to lay out for you some very effective ways of organizing your practice, in terms of material, and in terms of "time management". The goal is to maximize the effectiveness of our efforts. Some time should always be devoted to pure technique. Just the physical, mechanical aspect of playing. It is by working in this area that we development the Microscopic Awareness necessary for good playing. In my technical sessions, I consider myself a scientist going in to the lab, to investigate that new project, problem, theory , or whatever. I put it under the microscope. I experiment. I observe. I draw conclusions. I test them. The next day, I use review and carry it further. For example, I may notice one day that my third finger always tenses in reaction to my fourth finger pulling off to my second finger. I will make up exercises to work with this, applying the Principles of Correct Practice to the situation. How much focus needs to be put here depends on the player, the style, and the goals. The classical player needs a whole lot of focus here, the jazz player also needs a whole lot. The player who wants to be a speed demon, virtuoso rock guitarist needs a lot of attention and work in this area. If you just want to strum and sing songs, and not get too complicated, for instance, a folk player, then you only need to put some attention here in the beginning, after you get the hang of some chords and maybe a few runs, you can spend the rest of your life just learning more songs and using the same technique ( what I have called Horizontal Growth). I do find however, that most people are not really satisfied staying in one place technically and musically. Personally, I believe in continual development. I like to do 2 hours of pure technique a day. I encourage my students to always be doing something of a purely technical nature, usually at the beginning of practicing, since it also serves the function of warming up. Into this category falls all the musical materials you need for your chosen style. Some of them, of course, are common to all styles, things like basic chords, reading notes, understanding rhythm, etc. Some fall into more specialized categories. The jazz player needs hundreds of chords, in all their inversions, hundreds of scales in all forms, arpeggios, etc.. This is simply because these are the tools he needs in his toolbox, to play jazz. (Of course, it’s great to have these for any style, and I studied Jazz for many years to get a handle on these "musical materials", although I don’t really play jazz. I use them for arranging purposes). Learning music theory also falls into this category. I teach all my students music theory, as time goes on. The areas for continuing education as a musician are endless, and so you should always find something to put in this category. In the beginning, it should be the basic items I mentioned previously, that is, the basic chords, basic scales and licks for the rock player, usage of basic chords, like bass runs and rhythms, etc. Everything that gets you "up and running" as a guitar player. As you develop, it should include the study of Harmony, Musical Form, Song Form, and lyric writing for songwriters. This simply means learning things that you can play. It sounds obvious, but I know lots of students who always practice, but can never actually play anything! This subject needs a lot of elaboration, which I will do elsewhere, but let me make the main point here. You must, as soon as possible, learn whole songs or pieces that you can sit down, ( or stand up), and play. It is the quickest way to unleash your true potential, as it enables you to make the mental transition of feeling yourself to be a "guitar player", instead of a "guitar student". I have known people who play for many years and don’t feel like players. And that attitude shows in their playing. Everyone gets to join the club right away. Your membership dues are learning something to play, and then playing it for someone. It grows from there. Always devote part of your practice time to maintaining and developing repertoire. It is best to keep your repertoire, that is, the list of things you can play, written down somewhere, preferably in the Practice Journal you should be keeping (another subject). Also keep a list of the things you would like to play in the future. Reviewing and increasing your understanding of past material is vital. I mean, it is absolutely essential. And understand this. Your teacher will probably not make sure you do this. They are usually busy giving you new material. You must have the initiative to review things on an ongoing basis. There are many concepts you learn along the way that are impossible to grasp the first time you hear them. You should regard that first time like meeting someone for the first time. You are just getting introduced, don’t think you know them completely! An excellent example is understanding what the bottom number of the time signature means. It is usually mentioned in the beginning of learning how to read music, and it is IMPOSSIBLE to understand and appreciate it’s importance or what it means, because it involves abstract concepts which cannot be grasped without a good amount of experience. Every time you review, you strengthen your ability and understanding. Always have a list of things you are reviewing- repertoire, exercises, studies, concepts. This one usually gets people. People "can’t find the time". That’s the first obstacle. The answer is simple. At some point in your transition from child to adulthood, you are supposed to learn that us grown up types don’t "find" time, we MAKE IT. That is, we do if we want to consciously create the reality we desire, in this case becoming guitar players. So that is the first concept that needs to be understood. "Finding time" is the language of weakness and excuse making. It is easy. "Making time" is the language of strength. It takes some effort. It accomplishes. When you begin to get organized, you begin to "make the time", and you will see the results. Whether you do so or not depends as always, on the strength of your desire. I have to tell you that everyone who knows me considers me the most disorganized person they know. And I am, in just about everything except music and the guitar. Because that’s pretty much all I really care about, at least enough to make that effort. I often think that if I could be this organized about the rest of my life, I could probably rule the earth! So maybe it’s better this way. Write down your schedule. Use the chart below as it is, or as a guide. Write down when you will practice, and for how long. Revise it each week, based on what is happening in your life. Be realistic. Don’t feel guilty if you have to deviate from it some days, or modify it. It is there as a general guide, a tool you are using to help strengthen your Intention, not as a test or judge. It doesn’t matter how long you practice. It only matters how well you practice. Sometimes I practice for an hour without stopping. I often take a break from writing or some other activity, and practice for five minutes, or just play something. I always keep my guitars out and around me for this purpose. At the beginning of each day, think about how that day is going to go for you. Where do you have any free time that could be used for some practice. Don’t always be looking for that half hour block of time. You won’t always find it. Grab the guitar for 3 minutes and work on that chord change intelligently, the best way you know how. You will accomplish something, and if you are doing Good Practice, you will feel like you have accomplished something. Copy the chart below, enlarge it if necessary, and each week, sit down, and fill it in with the specifics from each area of focus. I have put in some examples. Check off each day when you do practice a specific area.